Used - good. Ex library copy with usual markings, slight warping of pages, clean and tigtly bound. Dustjacket very good with mylar cover. Alison Lurie is known for the sophisticated satire and Pulitzer-winning prose of her novels and stories. In Familiar Spirits, she lovingly evokes two true-life intimates who are now lost to her. 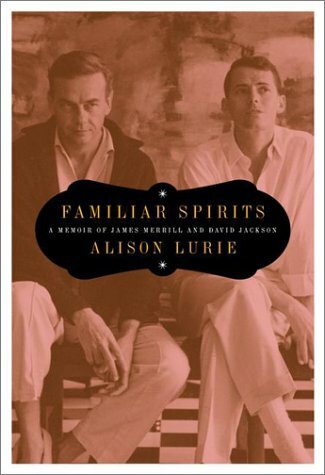 In her signature mix of comedy and analysis Lurie recalls Merrill and his longtime partner, David Jackson and their lives together in New York, Athens, Stonington, Connecticut, and Key West. Familiar Spirits reveals both the worldly and other worldly sources of what Merrill called his "chronicles of love and loss". Merrill was known for the autobiographical element in his work and here, we are introduced to the over thirty years of Ouija board sessions that brought gods and ghosts into his and David Jackson's lives, and also into Merill's brilliant book length poem, The Changing Light at Sandover. Lurie suggests that Jackson's contribution to this work was so great that he might, in a sense, be recognized as Merrill's coauthor. Her account of Merrill and Jackson's long and inspired relationship with the supernatural and its tragic end will not only surprise many readers, but stand as a poignant memorial to her lost friends.